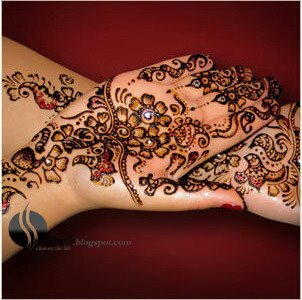 According to different cultural background mehndi (henna) can be divided into several types. Most famous types of mehndi designs are Pakistani Arabic, Indian and African. Designs from these diverse regions can easily be differentiated. Here are their individual features that will help you in identifying the type of design. Pakistani mehndi designs are a merger of complex versions of Arabic and Indian mehndi designs. These designs are also much detailed and are worn by brides on mehndi, wedding. Even children wear simple version of these mehndi designs on Eid festival. Indian mehndi are the most popular designs are very diverse. They range from simple designs to complex. Simple designs have a big dot or a figure in back of hand (dorsal) or in the center of palm. 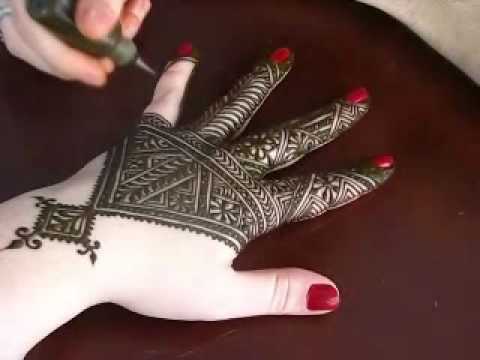 Finger tips are also covered by henna. This design is very easy and can easily be mastered by armatures. After some practice this design won’t take you more than a couple of minutes. Moving towards complex mehndi patterns we see highly detailed and fine designs. Such designs are sketched on important occasions like wedding, nikka etc. Such designs are hard to master and they can take hours just to finish one hands design. Mostly such mehndi designs are worn by Indian brides. Compared with the complex Indian mehndi designs, Arabic designs are much simpler. Arabic designs mostly consist of leaves, veins, flowers etc. These designs are perfect candidate if you want to extend the design from hand to arm or from foot to leg. Another distinguishing feature of Arabic designs is that the shapes are not filled, they are just outlines. These designs also partially cover your hands or feet. These designs consume less amount of mehndi and are easily dried which means that you don’t have to wait! Just like the Arabic counterparts these mehndi designs are also not filled. These designs are simple geometric shapes, consisting on lines, squares and dots. The space between the lines is not as much as that of Arabic designs. These designs cover your hands, arms like a fine mesh.